Schools newspapers are a great way to inform and entertain highschool and college communities, but they are often not taken seriously. Perhaps the reason for that is the fact that some school newspapers are indeed amateurish. But they shouldn’t be. With the right team and with the right tools, it’s possible to produce a highly professional school paper. It can be a daunting task, at first. There are so many things that you need to do, from team management and training to article writing, photojournalism, design, production and online student publishing. You might need a little help. We are here to provide that. This article is named “the ultimate guide for your school newspaper” because we have covered all the aspects of producing a student newspaper and managing the editorial team. We simply want you to be a little less stressed, while producing a quality student paper. This article is for everybody who is involved in the newspaper production, regardless of the role. 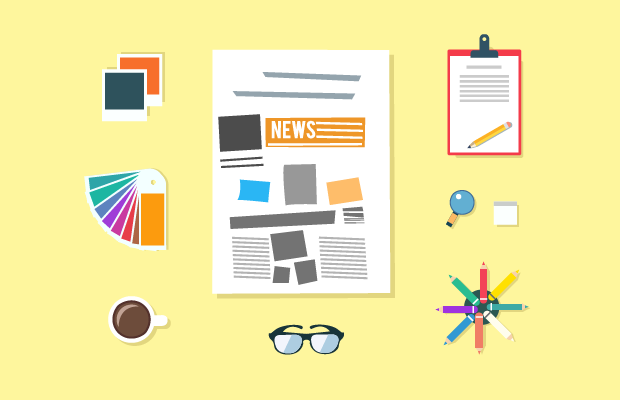 You’ll find some valuable tips for running and contributing to your school newspaper. Let’s talk about the structure of the student newspaper team. What roles must be present in your team? How should you structure it? How many people should be part of the team? There are many different ways to organize the staff, but you’ll likely end up with a team that is more or less similar to traditional newspaper team structure, with the addition of the faculty advisor. If there’s currently no structure in place or you have a very small team, you can start small. Baby steps. You don’t necessarily need an entire department to cover a role. Sometimes a single student is enough, especially if your school newspaper isn’t long (eg. hire just one designer instead of an entire team + art director). You can also have students take on multiple roles (eg: a student can be both editor and production manager). In some cases the faculty advisor becomes so involved in the production that he acts as a production manager. Make sure each one of these roles is covered, and start from there. As your team grows you will need more structure and clearly defined roles. This way each student will understand his place and purpose in the team, will know exactly who he has to report to, what is expected, duties and responsibilities. Even though job descriptions are not a standard practice in school newsrooms, writing them will be very rewarding. Yes, it will take some time, but it will not be wasted time, for sure. These job descriptions will help students perform better, and it will make the manager’s role so much easier. Some colleges offer paid positions for the newspaper staff, but most high schools and colleges do not. However, there should still be a “hiring” or selection process in place. Many students are interested in becoming involved in the production of the school newspaper, for various reasons: it’s fun, it’s a great learning experience, it looks good on college or job applications. That’s what it’s like to work on a college newspaper! These are all valid reasons to join the school newspaper crew, but not everybody gets to be a part of it, if there are too many people interested in a position. The best way to figure out if a student is a great candidate for a job is by interviewing him. These interviews usually take place in the first months of the first semester. After you finish all the interviews select the best candidates and let them know they’ve been selected. When you’re a part of a student newspaper team, you know that you’ll be there for limited amount of time. The team will change every single year: the most experienced student journalists will graduate and leave the school, and a new of inexperienced juniors will need onboarding. This is why training and onboarding is a never ending process in the school newsroom. It’s a fact of life, and it’s definitely a challenge, but it can be dealt with. Encourage the more experienced team members to train and coach the new hires. But oftentime, that won’t be enough, because not everyone is willing to take on this responsibility. Sometimes, they might need a little push. 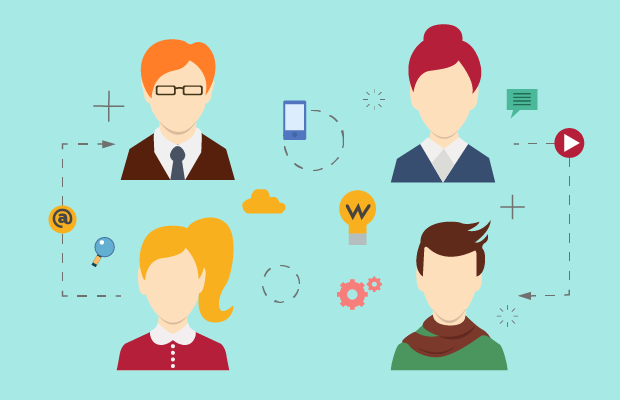 You might need to assign a trainer for each new person that joins the team. You can also invest time in creating a coaching manual for trainers and guideline manuals for trainees. It will simplify the onboarding process and reduce the hours spent coaching new colleagues. College newspapers function under the protection of the First Amendment, so students can truly express themselves and their opinions, even when their views are contradictory to those of the school. Yet, that doesn’t mean that the school has no control whatsoever over what gets to be published. The faculty advisor has the legal right to impose certain rules and standards, if the purpose is educating students. If the faculty advisor isn’t happy with the quality of an article he may suggest edits or reject it altogether. This doesn’t mean that he’s censoring free speech. There should also be some ground rules regarding copyrights, plagiarism, subjectivism and other sensitive issues such as violence and profanity. 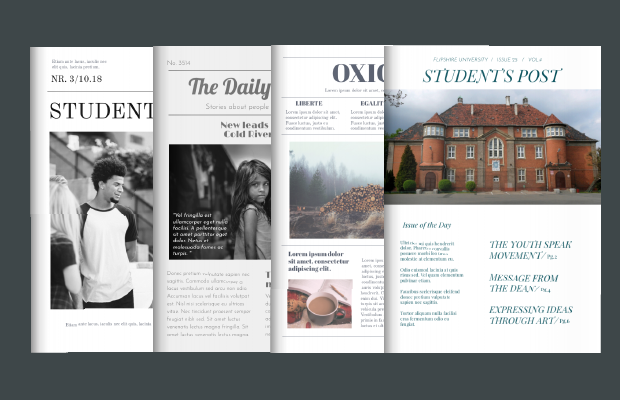 School newspapers and regular newspapers are structured in a similar manner, even though the topics are tailored to the audience. 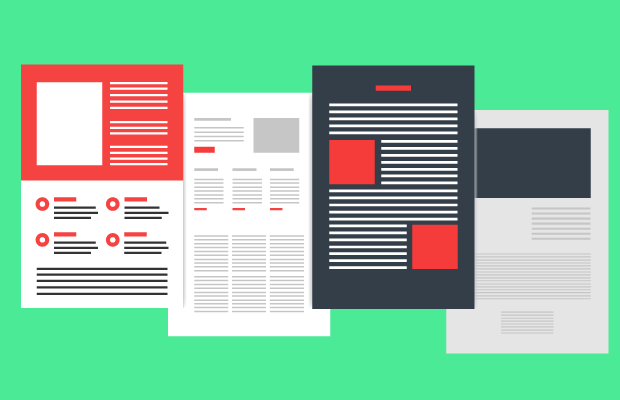 If you need some ideas for articles, take a look at the article types below. It will help you get organized and produce a well rounded newspaper. 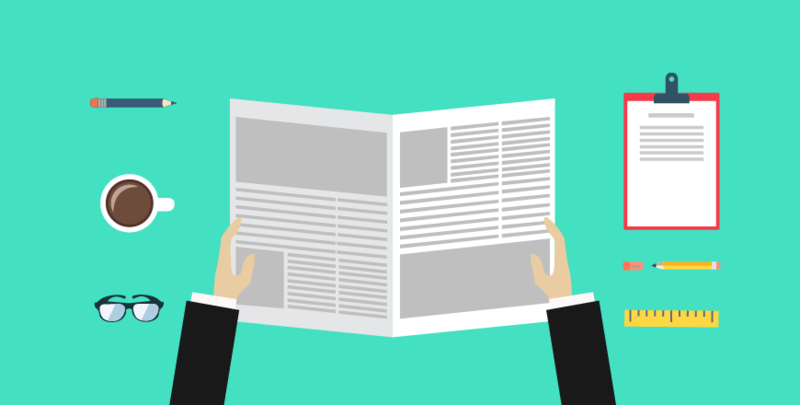 News articles should cover various events, policies and other school news that are interesting for students. These news don’t have to be limited to your high school or college. You can write about national and even worldwide news, but only if they provide useful information. For example, a worldwide student art competition could be the subject of a newspaper article. National laws and legislation regarding schools and education should also be covered in news articles, because they concern all students and will impact their lives. School news should be presented in an objective manner, presenting facts, not rumors or assumptions. They should be based on research and present different points of views. Each newspaper edition is likely to have a feature story. It’s the longest article in the paper, and the most in-depth. Feature stories revolve around facts, but they take a story to the next level by presenting context, quotes, reasons why it happened, ramifications of the story and implications. The article shouldn’t involve personal bias. It should be based on an elaborate investigation made by the journalist, interviewing multiple accounts. However, the feature isn’t limited to facts, it gives the journalist a little room for interpretation and embedding his opinion in the piece, in a subtle way. The topic varies. It could be some big news, an in-depth analysis of a social school phenomenon, a new policy or something else. Unlike the previous 2 types of articles, the editorial is an opinion piece. Still, the writer shouldn’t express his own views, but the opinion of the entire editorial staff. For that reason, the editorial is usually not signed. It’s a piece of commentary that appears to be written by an entire team. That’s why the writer/ editor shouldn’t talk about himself using the singular form of the first person: I, me, myself. The editorial should be entertaining or argumentative. In order to achieve that you can start by making a claim that could be controversial, then proceed by explaining your reasons and clarifying your claim. This flow will keep readers engaged. Some of them will agree with your point of view. Others won’t, but that’s alright. The purpose is to challenge readers. Just like editorials, columns are opinion-based articles. The content and topics are very much like an editorial. But the main difference between an editorial piece and a column is the signature. The editorial goes unsigned because it represents the collective views of editorial staff, but the columnist will publish his piece under his name. That’s why columnists can write about their opinions using the singular form of the first person. Sometimes an editor will publish a series of articles on the same topic/ similar topics, through several issues. All of the big newspapers publish reviews because they help the general public make decisions. There’s no reason why school newspaper shouldn’t publish review articles on various topics: school textbooks, movies, books, or even classes. Start by writing a short description of the thing that you are reviewing. Then add details about your personal experience. Include details about pros, cons, value for the money, performance mentions of other reviews, comparison to similar products. Try to be as objective and unbiased as possible. Don’t forget to write a conclusion in which you summarize the review and give a verdict: whether you would recommend the product or not. Companies pay money to have advertorials inserted in newspapers. The school context is different, but you will still need to include some promotional articles every once in a while. It may be for the school’s art or sports club, for a conference organized by the school or for a different event. Your article should offer useful details about the event/ club that is promoted and it should also present the benefits it offers for students in order to encourage them to participate / join a program / buy a ticket. This category includes tutorials and how-to articles with useful tips. Topics vary, but they should be school related, at least slightly. Here are a few examples: how to deal with stress, mnemonic learning techniques, tips for integrated digital learning, utilizing school resources, etc. These types of articles will help students deal with certain issues that almost everybody encounters. If you have a talented illustrator in your crew, you should make the most of his skills. Assign a space in your newspaper’s layout specifically for the cartoon. The topic should be something school related, something that students can relate to. The cartoon will put a smile on the reader’s face. Producing a professional school newspaper requires many skills and great teamwork. But building a team of talented journalists takes time and training. 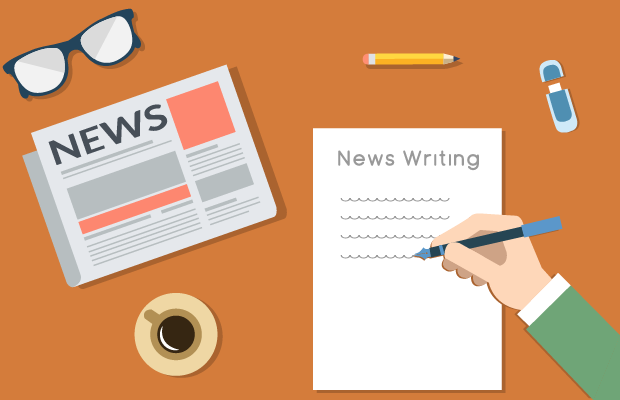 If you’re working with inexperienced student reporters and editors, you should start by teaching them the most basic news writings principles. Every journalist should know these. The inverted pyramid refers to a very specific structure of a news article, which places the most important information at the beginning of the story. The information that is less vital to the reader’s understanding comes later in the story. This is how you should present school news. Continue with a few paragraphs that contain other important details of the story. Writers should also integrate relevant quotes from their interviews with witnesses, sources or other people involved in the event. The next paragraphs should include other general or background information. Students decide what articles interest them from the school newspaper by simply scanning the newspaper and reading headlines. Every great writer understands the importance of a good, attention-grabbing headline, and young journalists should know it too. A well written headline is acts as a hook that makes readers want to read the entire piece. There are different types of headlines: humourous, mysterious, informative. The headline’s style should match the article. There are many other things to consider, but you can start by reading these tips for writing great headlines. There’s a lot of work that goes into an article. Sometimes the journalist has to gather all the information himself. In other cases, it involves interviewing witnesses or experts. There’s also that scenario in which the student will do research and find useful information in books, websites or other publications. Regardless of how you collect data, you should always cite your source. It will add credibility to your story. It goes without saying that all journalists, including students, should check the reliability of their sources. Don’t just pick up information from dubious online sites. In some cases your sources will ask you to protect their identity. It will probably not happen very often in the school context, but if they do, you must respect their wish. Make sure that the most experienced editors are reviewing and editing every article before publication. Obviously, the writer should be the first person to edit and check for spelling & grammar mistakes. But that’s not enough, not if you have high standards for your school’s paper (which… you should). Submit each piece for peer review. The reviewer should analyze grammar, spelling, tone and voice, as well as other standards imposed by the production manager. Encourage students to provide useful, objective feedback. Don’t get offended if they make a lot of comments and suggestions. Writing for a school newspaper is a learning experience. You can’t get better if you don’t learn from your mistakes. Obviously, the reviews should always be made by an experienced editor. We recommend the art director and production manager to make a style manual because it will help students get familiar with the design guidelines and learn to respect them. The manual might change over time. You don’t have to provide extremely detailed guidelines to make it useful for newspaper design. The newspaper style guide should cover the general layout, number of pages, font types and sizes, guidelines for photos and cropping. 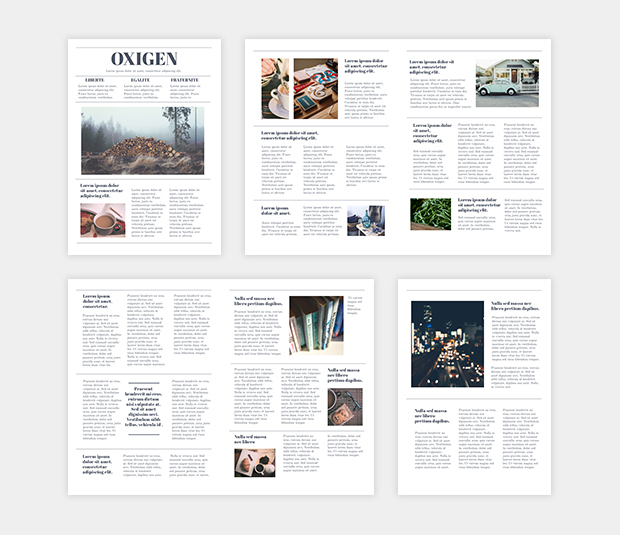 These rules will guarantee some visual consistency for your future newspaper editions. Ask all designers to get familiar with the rules, before they start working on their first assignment. It will help save a lot of time and headaches for the art director/ production manager. The newsroom is a very busy and exciting place. Everybody works on something, and the production manager has to coordinate everything, making sure the design and the copy complement each other. Communication between designers, art director, editors and production manager is key. It’s challenging, but rewarding at the same time. Designers will work with dummy texts at the beginning, until editors finish their part. It also means that they will have to make edits to the design and make small adjustments so that everything looks great. 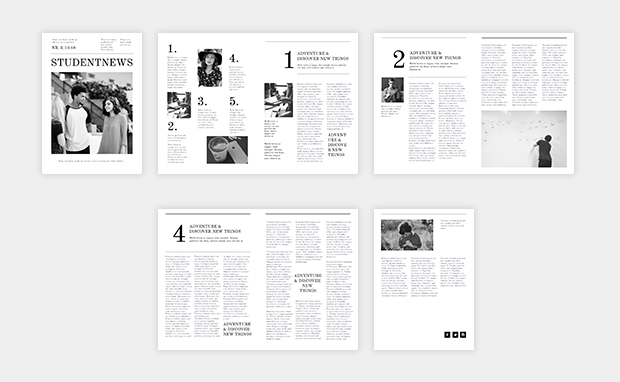 If you are a designer working for a school paper, learn about grids, composition and editorial design principles. Your design should look great and provide a great reading experience. We made a few school newspaper templates that are free to edit online and to publish them digitally. These templates are the perfect solution for very small or inexperienced teams, because they will save you a LOT of time. 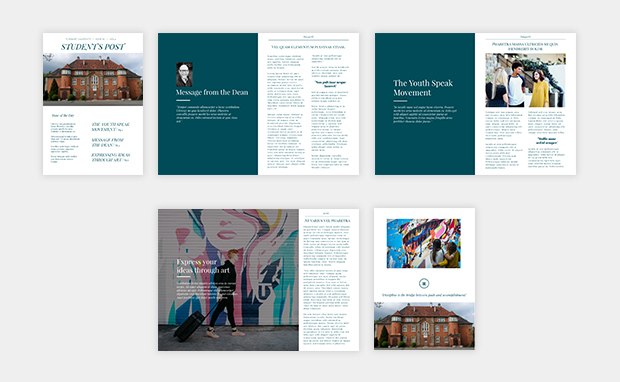 Take a look the images below to see some of our school paper templates. 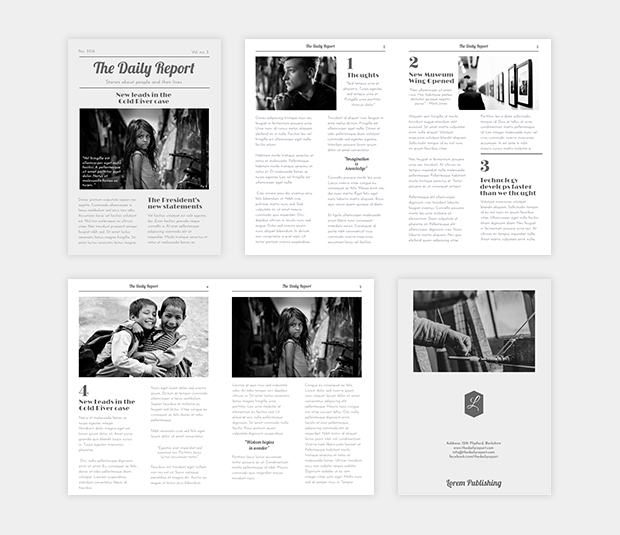 You won’t even need a designer or art director if you know how to edit and adapt these newspaper templates to your needs. Start editing your favorite newspaper template very easily. Just click on images and register for an account. Then you can customize these layouts in the editor with a simple click on these images. 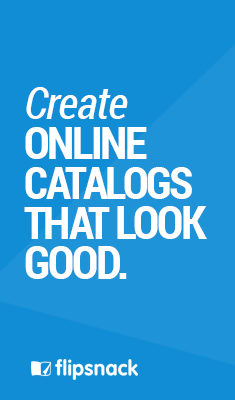 You can add more pages, duplicate pages, delete pages and do extensive customization. There’s also another option for advanced designers. They can create their own layouts from scratch in our online editor, starting with blank pages. Or, you can even upload a ready-made PDF to Flipsnack and we will turn it into a beautiful page-flip document that’s highly shareable. When you’re done editing, proofreading and you get the final approval from the production manager, you can go ahead and download a PDF copy of the newspaper design on your computer. It requires a premium subscription, but it’s worthed. The downloaded PDF is printable, so you can take it to print right away. Nowadays many newspapers are digital-only, for various reasons. It completely removes printing costs and it’s eco-friendly. No more paper, no more trees being cut! We think this is a great solution for schools, especially because the young generations of students are digital natives. 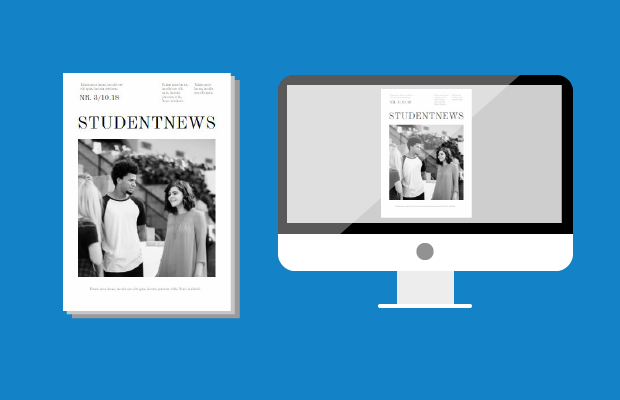 If you decide to try online student publishing, you have 2 options: publish the newspaper as a website/ blog or publish it digitally as an online newspaper with turning pages. The second option is probably easier to produce, because it doesn’t require constant updating. The stylish look is an added bonus. And let’s not forget about the fact that you can start from a school newspaper template. The digital version of your student newspaper is free with Flipsnack. We will host it online on our most secure servers, so you don’t have to worry about hosting (or anything else, for that matter). All you will have to do is share the link with students, or integrate the newspaper in your school’s website (very easily) with the help of the embed code. Anyone can do it, it doesn’t require tech skills. Hope you found this useful. What are your biggest challenges in writing for / designing or producing your school’s newspaper? Thanks for this. As a newly appointed editor in chief (my 1st time), I have to re-access my knowledge about student paper and the ways so I’m glad I found this site! So glad that you found this useful! I really appreciate your tip to have someone be in charge of the layout when you publish your newspaper so it looks natural. My wife and I have been thinking of getting our daughter into the school newspaper so she can make friends. I will be sure to tell her to ask about a layout specialist. Hello. I find this article useful to my study. I would like to ask for the complete name of the author and the date of its publication so I can have the citation.